Shadow of War has gone through some changes since it launched last October. The much-criticised loot box marketplace is gone, leaving a fairly unsullied orc murder/management sim. Now, there’s a free demo to download if you’re thinking about trying it out. 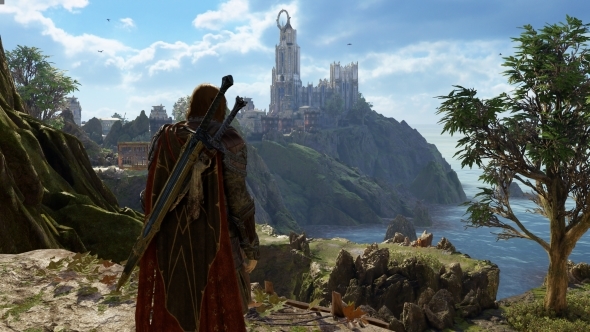 The demo includes the complete Núrn region of Mordor from the game. This area might be a bit of a surprise to players coming to Monolith’s take on the Mordor of Tolkien’s fantasy world, as it’s a bright jungle island rather than a blasted volcanic hellscape. Núrn also was the second explorable area in Middle-earth: Shadow of Mordor, but you see a distinct region in Shadow of War. If you like talking with orcs better than stabbing them, have a look at our list of the best RPGs on PC. In the demo, you’ll be able to play all of the quests and complete all the activities in Núrn, including building up an orc army and taking over the local stronghold once you’ve put together a big enough attack force. There’s quite a bit to do in the area, and it’s where you meet one of the game’s funniest – and subsequently, most upsetting – characters, the Australian-accented Olog-hai Brûz the Chopper. Matt reviewed Shadow of War for PCGamesN and gave it high marks. He loved the drama of the newly-introduced fortress sieges, but dinged it for its obnoxious microtransactions. Fortunately, those have been stripped out, and this new demo seems like WB Games asking players to give Shadow of War a second look now that they’ve course-corrected. To download the demo, just head over to the Shadow of War Steam page. You’ll find the link for the demo in the right-hand column, underneath the box that tells you how relevant Steam thinks the game is to you. If you try it and like it enough to buy, your progress in the Shadow of War demo will carry over into the full game once you’ve made the purchase.